The Computer is Dead! Long Live...Anybody? 96 pages of gloom, doom, and dark designs -- not to mention more info about MegaWhoops Alpha than anyone could ever want to know! Paranoid fiction that will knock your jumpsuit off -- nearly 40 pages of stories and songs about everything from the "Moment of MegaWhoops" and "Tales From the Vulgar Scrubot" to "The New Fear and Ignorance." Capsule adventures, capsule adventures, and more capsule adventures - and a modestly brilliant mini-adventure, "A passage to NDA Sector" - to get you started in the Post-Crash Complex! 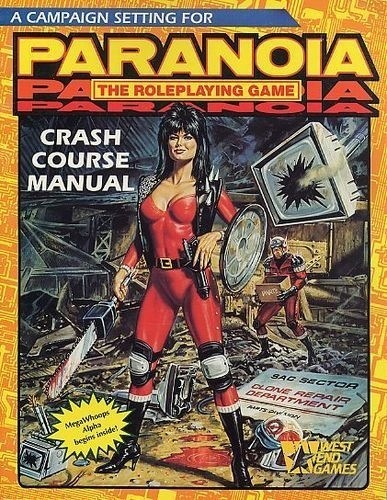 The most treasonous document ever printed in any Paranoia adventure or supplement (no, really, we mean it this time). At last, "101 uses for The Dead Computer" can be revealed to the public! 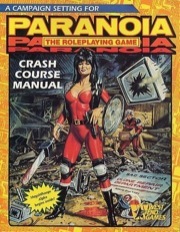 Sign in to start a discussion about Paranoia RPG: Crash Course Manual!